The oldest golf club in existence, the Honourable Company of Edinburgh Golfers was formed in 1744 and golfed in both Leith and Musselburgh prior to moving to the messy medium-sized dunes of Muirfield in Gullane in 1891. Overlooking the Firth of Forth, the Muirfield links was first designed by Old Tom Morris but altered substantially in 1928 when the club purchased additional land and employed Harry Colt to rearrange the links into its current form. Rather than a traditional strip of linksland, at Muirfield Colt was presented with a squarer paddock of ground which enabled him to famously devise his much copied two loops arrangement with a counter-clockwise back nine laid within a larger clockwise front nine loop. This ensured that the golfer experienced the wind from every possible direction. To complicate play, Colt lined his holes with some of the most brutal bunkers in Britain. His original plans had in excess of two hundred traps, although more than one hundred were removed a few years later at the suggestion of Tom Simpson. Like most championship links, Muirfield is a beast in high wind when the otherwise generous driving areas shrink and avoiding the deep hay and punishing pot bunkers turn it into a test of survival. The course begins with a right-bending par four that in every way sets the tone for the round, thread the eye of a needle off the tee or approach the green with your third. Better moments to follow include strategically bunkered par fours at the 6th and 8th, the long 9th which heads along an out of bounds stone wall, the gorgeous short 13th and one of the sternest closing runs in the game. 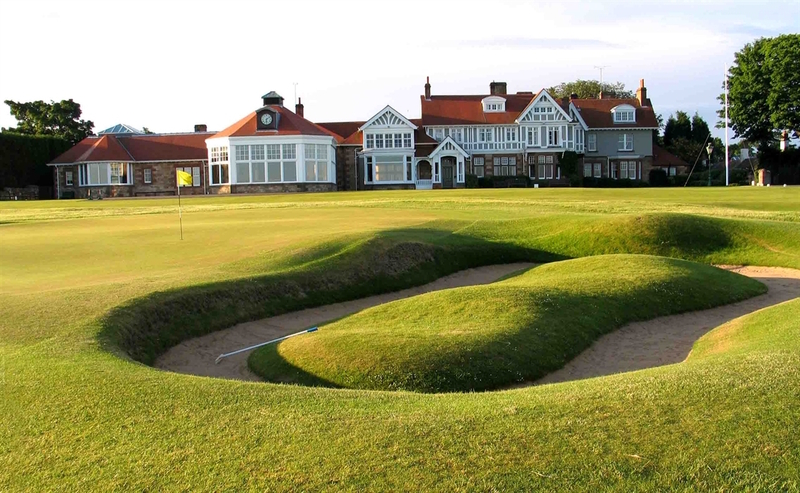 The real highlight of Muirfield, though, is the bunkering and the contouring of the green surrounds. The 3rd green, set attractively between the dunes, is a stunning example as are beautifully protected targets at 4, 5, 11, 12, 13, 15 and 16. Far from the most attractive links on the Scottish East Coast, Muirfield works due to the logic of its structure and the consistent and intelligent quality of its holes. There are few here that really stand out as exceptional but none, aside from perhaps the 10th, which golfers might look upon with displeasure. One common gripe with the links is that it cramps you from the opening tee shot right through to the final approach, sweating on you to make a mistake and punishing you severely when you do. The chances of playing the sort of brave recovery shots or risky wrong-angle approaches that you will elsewhere in Scotland is reduced by the fact that a slight spray here often means a sideways chip or sand blast. Muirfield polarizes popular opinion with some critical of its bleak landscape and penal severity, and others convinced that, by virtue of its difficulty, it is the greatest links in the world. There is little doubt that most of Colt’s best holes exist elsewhere, but equally this is undeniably his most difficult course and most suitable tournament venue. The ruthless routing is also the most effective at exposing deficiencies in your game and if this really is the hallmark of great golf then Muirfield may well be, as often rated, among the best ten tracks on the planet.